After last weekend’s photo finish, Hollywood leaves nothing to chance this frame, as we’re about to have a new king of the jungle (sorry) by a significant margin. Rudyard Kipling’s The Jungle Book has been a frequent target of Disney film adaptations through the years, with the most famous being Disney’s animated classic from 1967, but also saw a live action adaptation in 1994 and an animated sequel in 2003, with some straight to video releases here and there. Now, because they can and because technology these days is pretty awesome, we have another live action offering. 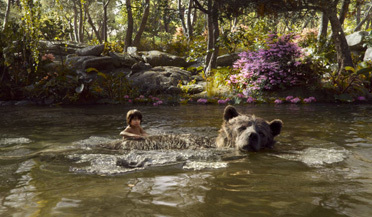 Like most remakes and updates today, The Jungle Book is essentially a reboot: the story of a boy named Mowgli raised in the jungle by a bunch of anthropomorphic animals who speak to him, raising the ire of one not-so-friendly tiger who believes the presence of a human threatens their existence. The film introduces 12-year-old Neel Sethi as Mowgli, but the real highlight is the voice cast, which includes Bill Murray as Baloo, Lupita Nyong’o as Raksha, Scarlett Johansson as Kaa and Idris Elba as Shere Khan, the film’s primary antagonist. Directed by Jon Favreau (didn’t see that one coming, did you? ), The Jungle Book is getting rave reviews for both its use of CGI and for successfully updating the timeless family film. Zootopia has had the the family market on lockdown for the last several weeks (and crosses $300 million this weekend), but here’s something beyond perfect for families and the weekend’s box office will reflect that. Look for a great weekend of $76 million.